PR Checking Tool.com - What is Pagerank? Pagerank (AKA PR) is the term created by Google in reference to their algorithm which ranks web pages. The term Pagerank is derived from "Larry Page", the cofounder of Google, who along with Sergey Brin developed the Google ranking algorithm. 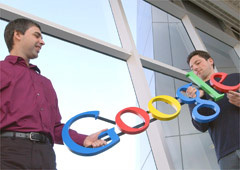 Pagerank is a scale that Google uses internally to value the importance of each web page. The exact Pagerank of webpages are not published; however, Google does report whole number values based on a 0-10 scale. Even though the value reported through the Google Toolbar is not and exact measure, it is, however, designed to be a fair representation of how Google values a particular website. Note: The real Pagerank may have a much higher range such as between zero to one million and/or may even use decimal points..
Pagerank is a voting structure that calculates the importance of web pages by the number of incoming links to them. Normally the more incoming links a page has the higher its Pagerank value will be; however, the Pagerank algorithm is rather complex and will take into consideration other factors such as internal link structure of a website, as well as the link popularity of the websites linking to the site in question. Normally internal pages of a website will have incrementally lower values based on their degrees of separation from the home page. For example, if the main page has a PR4, it is very likely that the internal pages, which are one click away from the home page, will be assigned a Pagerank of 3. This is of course not a hard and fast rule, as the internal link structure of a site will have an impact on how the Pagerank 'flows' through the pages of a site. At times many internal pages may have a value equal to that of the main page or have no Pagerank at all. To get the highest possible Pagerank for all the important pages, it is helpful to cross link all your important pages to one another. It is especially important to have links from your main to your important pages. It is also recommended that your home page have a link from all of your internal pages. It is important to note that the Google Toolbar does not always display the latest Pagerank value, as the public data is updated once every 3 to 4 months. By using our Pagerank check tool, you will be able to see the Pagerank that is being reported by several data centers, and hopefully get a more accurate representation of what the current Google Pagerank for a site or page is. Most websites with less than 100 links will have a PR value between 3 to 5, but also remember that it is not only the number of links which is important, but also the quality of the links. For example, it may be possible to get a PR6, just by having one link from a PR7 or PR8 website. It is a difficult task to achieve a Pagerank higher than 6 without having hundreds of thousands of links or a few links from high PR sites. There are currently less than 150 websites which have a PR10. Sites with a higher Pagerank will normally have a better Google ranking for keywords appearing on their websites; however, Pagerank is not the only ranking factor. Other factors may include: keywords in title tags, keywords in page content, and keywords in the anchor text of incoming links. For further reading on Pagerank algorithm see Wikipedia. Disclaimer and Warning: Google and Pagerank are Trademarks of Google, Inc. Our tool offers access to their public databases. Please read Google's Terms and Policiesand make sure you agree with them before using this tool.